Scientists and text books incorrectly apply Bernoulli's Principle to explain lift. The drawing to the left is typical. Air flows down through the hole in a spool of thread, and a playing card adheres to the bottom of the spool. Contrary to popular belief, Bernoulli's Principle does not explain this curious phenomenon. The Theory of Radial Momentum does explain this, and many other phenomena as well. 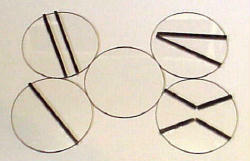 Levitator test disks, like the playing card, above, that allow for radial expansion of air, all adhere to the spool. Only the disk that entrains parallel flow fails to adhere. This indicates that radial expansion of air, not its velocity accounts for lift. 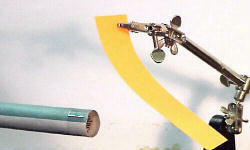 Air flow through a paper cone tends to collapse the cone while air flow through a paper tube has no such effect. This demonstrates that pressure relates to radial expansion of air, not to its velocity. Pressure equals 1/3 the square of Radial Momentum divided by the product of the mass and the volume. For spherical expansion, pressure is inversely proportional to the square of the radius of expansion. For planar expansion, pressure is inversely proportional the radius of expansion. Scientists, Academics, Web Sites and even NASA apply the Bernoulli Principle incorrectly to the analysis of lift. 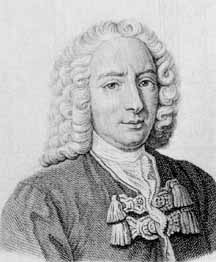 Ironically, Daniel Bernoulli, himself, predicts this abuse, stating, "It would be better for the true physics if there were no mathematicians on earth." This site shows the nature of Bernoulli Abuse, and aims to set the record straight. Say a bomb explodes in space. The fragments speed out, radially, in all directions so all the particles have Radial Momentum relative to the center of mass. The sum of all these individual momenta from all the fragments is the total Radial Momentum of the system. Like linear momentum, Radial Momentum obeys conservation laws. The particles keep expanding out into space, and the volume they occupy becomes larger and larger, so the volume density of the particles decreases, and the pressure drops. PV = NRT. Another name for pressure drop is lift. For hundreds of years, scientists and text book writers keep trying to explain that lift is "caused by" the linear velocity of a stream of fluid. This is incorrect. To support this fallacious reasoning, they use a form of Bernoulli's Principle that does not apply to the particular physics of lift. This web site demonstrates with simple experiments and models, that Radial Momentum (the expansion of particles and the decrease of density) and not linear fluid velocity accounts for pressure drop. Bernoulli's Principle is a statement of energy-balance. It is extremely useful in many applications. Many academics, text books, web-sites and even the NASA mis-apply Bernoulli's Principle to analysis of lift. This is nothing short of Bernoulli Abuse. In line with the principles of No good deed goes with out punishment for long and Pioneers receive, as their reward, a tail full of arrows, I notice this web-site receives various reviews on the net, and commentary by reputable academics all implying this is the work of an insane crack-pot madman. While I do not dispute the personal characterization of me, I do take issue with the hasty and emotional dismissal of my claim of Bernoulli Abuse. I'd like to post one such a reaction, from a reputable authority, below, so you can get a feel for the other side of this argument. The common thread in these reviews is that they simply do not address the physics arguments. They also do not propose any mathematical derivations to explain the simple phenomena above, phenomena that you can easily demonstrate in your home with readily available supplies. These critics who ignore the physics argument, prefer, instead to whine about an incorrect assumption of their own making, namely: they claim I am somehow disputing Bernoulli. Far from that, actually opposite that, I view Bernoulli's Principle as a fundamental and beautiful energy balance equation. My claim is that the currently popular methods that explain lift use Bernoulli's Principle incorrectly. That is pure and simple bad physics, an abuse of Bernoulli's Principle. Here is one of the main whiners. You might like to ask the authors to read this site more carefully and then to provide some formal physics to go along with their facile fizzing. Seykota maintains a website in which he apparently denies the validity of the Bernoulli principle and other well-established laws of physics. Seykota refers to his theory as the theory of radial momentum. Seykota's account of his "theory" appears to be too vague to admit criticism. For example, he claims that for spherical expansion, pressure is inversely proportional to the square of the radius. But according to mainstream physics, this statement is incomplete, since we are not told what is expanding (ideal gas?) into what (vacuum? ), nor whether the pressure is varying spatially as well as varying over time, and if so, where he is trying to evaluate the pressure. Seykota's theory was listed on www.crankdot.net . The serious reader can see that I am not denying the validity of Bernoulli's Principle at all. I am, rather, blowing the whistle on its mis-application and claiming that these mis-applications are pure and simple bad physics. I also develop a rigorous simulation model that explains the operation and pressure and density profiles of various devices, including the Levitator. In particular, my model explains the cavitation ring and the relationship of bulk modulus to lift. No other model that I know of even comes close. Indeed, popular explanations rely on simplifying Navier-Stokes with a incorrect assumption of incompressibility. Lift, in my view is largely a density phenomena, so compression and de-compression are essential components. These essential components happen to rule out using Bernoulli's Principle. One form Bernoulli's Principle has PV + Mv²/ 2 = k1. This is a straightforward energy balance equation. Pressure times Volume plus one half the Mass times the square of the velocity is a constant. The thermal energy (PV) plus the kinetic energy (Mv²/ 2) is always constant. You can store energy by inflating an automobile tire to a high pressure. You can store energy as a mass of moving gas. You can convert these forms back and forth and the total energy stays constant (except for conversion losses). Beautiful. the infamous P = k/V - dv2/2. Pressure equals a constant minus half the density times the square of the velocity. The problem with this form, is that we cannot use it unless density is constant and neither can we go around willy-nilly dividing things by volume unless we define what we mean by volume. In the case of radially expanding gas, density is no longer constant and volume is ambiguous. So we have an equation that no longer fits the conditions of expanding gas. The equation that does fit the situation, Navier-Stokes without the incompressibility simplification, is just way too complex to solve. I manage to get around this by applying numerical analysis. 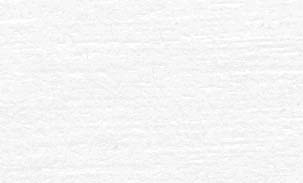 I use Euler's method of incremental solution of a system of Integral equations. My solution for the Levitator is consistent with experimental observation in a number of substantial ways. It predicts the pressure gradients, the cavitation ring and the bulk modulus effect. It also predicts an inverse lift-separation effect which I also measure experimentally. No other solutions that I know even come close to explaining all these experimental observations. Academics who don't go to this extent, and take the easy (and wrong) route and continue to apply the derivation of Bernoulli's Principle where it does not belong, are committing Bernoulli Abuse. They take an equation that does not apply to varying density phenomena [ P = k/V - dv2/2 ] and jump to the silly conclusion that since Pressure is on one side and the negative square of velocity is on the other side, that Pressure always goes down as the square of velocity. This is patently ridiculous. It allows for bizarre conclusions like there is a velocity beyond which you get negative pressure. It predicts that people speeding along in a train must be experiencing low pressure in their cabins relative to us. It also predicts that, relative to them, we must be experiencing low pressure. These are a few of the most egregious form of Bernoulli abuse. Unfortunately, these are not the only examples. Mis-applications to airplane wings are right up there. Most people don't really grasp the standard fast-air, slow-air curvy wing theory of wing lift. No wonder. It's wrong. With this site, I invite you to examine my arguments, in great mathematical detail, and to challenge the abusers to come clean and admit their misapplications do not hold water, gas or much real science. I invite you to join with me in the crusade to Stop Bernoulli Abuse and to put the pressure where it belongs - on the abusers. I'm Ed Seykota and I approve this message. 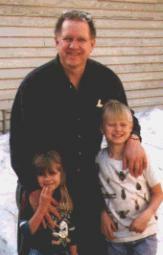 Ed Seykota, circa 2000, at Lake Tahoe Nevada, USA, with son, Ziz and daughter, Aziza. He has an engineering degree from MIT, specializing in servo-dynamic modeling and computer simulations using Euler's method. To observe and document the spread of the Theory of Radial Momentum, Ed Seykota is using the Internet ... to encourage the scientific community to examine, challenge, contradict, support and otherwise extend the Theory of Radial Momentum. For the origin of the project, see I Wonder.